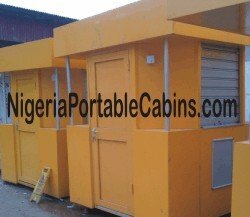 Portable metal buildings (or portable steel buildings) are metal buildings that are built to dimensions that make it easy for them to be relocatable or transportable across roads in Nigeria to any destination where they are needed. So, why are they referred to as "portable"? The answer is embedded in the first sentence above. They are referred to as "portable" because they are transPortable . . . they can be moved from one location to another with ease. This is one of the key benefit of using portable steel buildings for your home or office. When you use portable metal buildings for office, you give yourself the flexibility of calling the shots. Suppose you recently rented an office and spent substantial sums renovating it and upgrading it to the standard you want. Unfortunately, you discover that . . .
. . . or something else happens that inspires in you the desire to quit the building like yesterday. But wait. What is the cost of quitting? Yes, you would lose your hard-earned money spent upgrading the office to your class or the stylish taste of your clients. And that cost can be huge depending on your kind of business and your taste. But what if the office is a mobile building or relocatable portable metal building? You simply hire a vehicle and relocate the building with everything intact to the new office location. No need to over-flog the horse. You've already guessed the benefits and savings you get when you use portable prefab office accommodation. Yes, you now know the benefits of choosing portable office buildings over traditional unmovable commercial houses in situations that allow you to make that choice. So, thinking of building a factory? Use our prefab factory construction service. Thinking of building an office complex? Yes, adopting the prefabricated building approach can deliver the project much faster than you think possible. Thinking of maximizing your revenue from real estate investing by investing in student hostel accommodation? Go for prefab hostel accommodation. Can prefabricated sandwich panels be used for construction of residential accommodation? You can go portable even when you want to build residential accommodation. For example, you can build prefab bungalows and prefab duplex with prefabricated insulated sandwich panels. In simple words . . . metal portable buildings can be used either as portable office building or portable homes. In fact, you can even use portable steel buildings as . . .
You can never go wrong when you go portable. When you purchase a portable prefab metal building or portable office building from us, you cut your startup cost and you empower yourself and your business with the ability to take advantage of emerging small business markets especially in business districts with high influx of potential customers but with limited space. Yes, portable buildings empower you to do business where many cannot. Click HERE to request a quote and begin to reap the benefits of using portable steel buildings for your home or business.